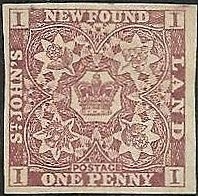 Newfoundland issued its first stamps, the "Pence" Issue, in 1857 (Scott #1-9). These pictured the Rose, Thistle, and Shamrock, representing the union of England, Scotland, and Ireland, a fitting symbol since many of the early immigrants to the colony were of Scottish or Irish descent, and wished to discard archaic hatreds as they made their way in the New World. 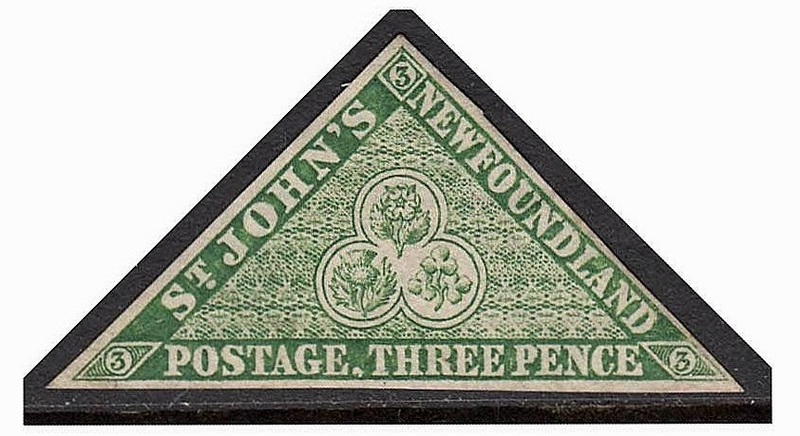 The set includes the first triangular stamp issued in the Americas, the 3p Green (Scott #3). 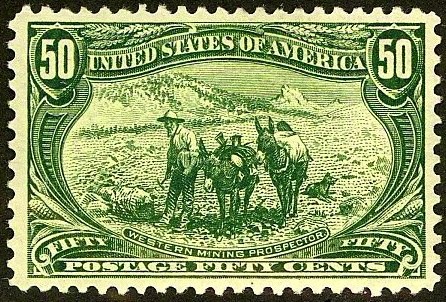 All of the stamps of this issue are scarce to rare, and worthy of consideration as investments. Five of the stamps (Scott #2, 4, 6, 7, and 9) are somewhat pricey, and the best way to purchase them is probably as used VF-appearing seconds with minor faults such as shallow thins or unobtrusive creases, if such can be had for 10% to 15% of catalog value. Should there be any doubt as to authenticity, insist on making the purchase conditional on obtaining expertization. There are some fairly convincing forgeries of this issue, especially by Sperati. With a population of about 31 million, Canada is one of the world's wealthiest countries, and is one of the world's top ten trading nations. GDP growth has averaged just over 1% over the past five years, which takes into account the decline of 2.9% in 2009 due to the global financial crisis. Canada's population is expected to age significantly over the next decades. Canadians over 60 are projected to increase from 16.7% of the population in 2000 to 27.9% in 2025, and 30.5% in 2050. Consequently, in the future, many more Canadians will be spending time working on their stamp collections on cold winter days.